George Graham Reviews Hot Tuna's "Steady As She Goes"
A fair number of rock performers from the 1960s are still doing their thing, though many have settled into a kind of nostalgia groove, replaying their old hits. But others are staying active creatively, and this week we have another good example. Actually it's the first new recording by this venerable band in 20 years: Hot Tuna, whose new CD is called Steady As She Goes. Formed around 1970, Hot Tuna was known as an offshoot of the seminal San Francisco psychedelic band the Jefferson Airplane, but the two principle members of Hot Tuna go back even before that. Guitarist Jorma Kaukonen and bassist Jack Casady have been playing together for more than 50 years. They started as teenagers in Washington, DC, playing folk and blues in various groups. Kaukonen, son of a diplomat, and Casady, four years his junior and the son of a dentist, stayed in touch as Kaukonen went to college in Ohio, and then California, and was increasingly attracted to the music of folk blues artists like Rev. Gary Davis. While in California, Kaukonen was recruited to play guitar for a new band in San Francisco which became the Jefferson Airplane. Kaukonen called his long time friend Casady who joined, holding down the bass. But Kaukonen and Casady's interest in blues continued and around 1970, they started a side project playing concerts of acoustic blues. With the success of the Jefferson Airplane, they were signed even before they came up with a name for the group, which became, in those psychedelic band-naming days, Hot Tuna. The group was notable for releasing their first two albums which were both called Hot Tuna, though one was acoustic and the other electric. A prominent member of Hot Tuna in the early 1970s was the late blues violinist Papa John Creach. Hot Tuna long outlived the Jefferson Airplane, and Kaukonen and Casady have been occasionally performing together ever since. But though they have been playing live, and both Kaukonen and Casady have released solo albums, it has been twenty years since the last official Hot Tuna studio album. Asked why it took so long, Kaukonen said it was "just not right" until now. Hot Tuna has been known for alternating electric and acoustic albums, but this recording has both. Kaukonen has likened it to their classic 1971 LP Burgers. This incarnation of Hot Tuna features interesting choices to round out the quartet. Barry Mitterhoff is a mandolin specialist and was a part of Tony Trischka's progressive bluegrass band Skyline, and he was also part of another creative acoustic group, Silk City. But on this CD, he applies his mandolin in a bluesy way, and also plugs in and plays some electric mandolin. The drummer is Skoota Warner, who has worked as a sideman for such people as Cyndi Lauper and Santana. The producer is Larry Campbell, known for his work with Bob Dylan. Campbell worked with Kaukonen on previous solo albums, and he is quite the multi-instrumentalist, adding guitar, keyboards and fiddle to Hot Tuna. Steady As She Goes is a kind of epitome of Hot Tuna's music, containing both old-time blues tunes, including two from Rev. Gary Davis, and original music, some of which has a classic rock sound. There are also a couple of tracks with almost a singer-songwriter feel and philosophical lyrics. It's a generous collection of songs that was recorded in Woodstock, New York, at Levon Helm's studio. I think it's one of the band's best releases since the Burgers album forty years ago, though it's not completely without its lapses. 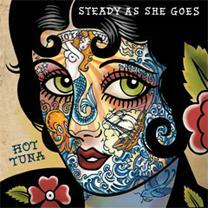 Steady As She Goes the new CD by the 40-year-old group Hot Tuna, comes 20 years after their last full studio album. The 50-year association of guitarist Jorma Kaukonen and bassist Jack Casady is as strong as ever, and this new recording is one of their best and probably their most musically diverse within single album. There's traditional and original material, electric blues, acoustic-oriented tracks, and even some country twang. And almost all of it was handled tastefully. The addition of mandolinist Barry Mitterhoff as a regular part of the group was an intriguing but ultimately very artistically successful move. Our grade for sound quality is close to an "A." Everything is well recorded, a rarity these days, and the dynamic range is not bad for a rock album. Hot Tuna started out as being a side-project. But here they are all these years later still making music together, taking their influences from what inspires them, and creating worthwhile music that will be a real boon to their long-time fans, and perhaps attract some new ones along the way.